Brrrrrrr . . . we drove north to Concord, New Hampshire today and as soon as we were out of Boston, we started seeing some piles of snow along the road. I know I heard that there was snow in the Northeast over the weekend, but not until we got to Concord and found the ground still covered with a few inches of that white, fluffy stuff did the reality really hit me. The last time it snowed in Concord for Halloween was over a hundred years ago! I sure hope this is not a precursor of a colder than normal winter. But despite the snow today, the sun was shining and it felt warm while we were working in the storage unit. 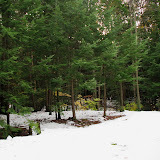 It is usually freezing when we are there, so we stayed a little longer than usual and really tried to go through things. We have a much better handle on what is there and we came away with winter coats and clothes for the cold time. This evening we went to a Concord Yacht Club meeting. It was great fun to see old friends, the dinner was fabulous, and we truly enjoyed the speaker. Mark Klinker, a Concord cardiologist who decided to spend six months as the physician at the South Pole. He has always had a fascination with that part of the world and his photographs depicting day to day life in that VERY chilly part of the world were fascinating. After the yacht club meeting, we came back to Alan and Helaine Kanegsberg’s home. It was great catching up on what has been happening in their lives. All in all, it was a very successful trip. We just hope we don’t take any of this snowy weather back to the Cape with us tomorrow. We just got home from Heather’s and we left here twelve hours ago. It has been a long day. We have definitely decided to make the trip to New Hampshire tomorrow and we heard back from our friends Alan and Helaine Kanegsberg telling us we are welcome to stay with them tomorrow night. So all is set. It seems we are always making a last minute decision to go to Concord and the Kanegsbergs are always welcoming. We truly appreciate their flexibility and willingness to put up with us. Thank you, Alan and Helaine. 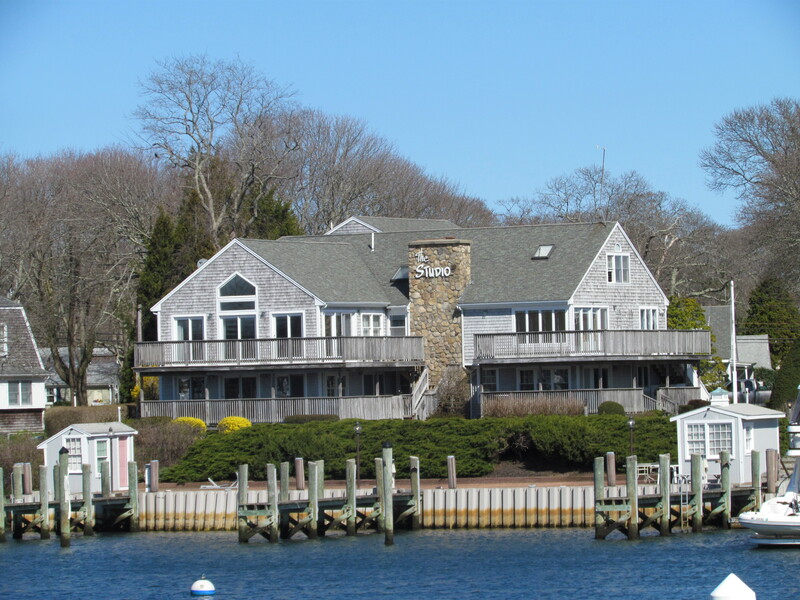 And we are so looking forward to seeing all our friends at the Concord Yacht Club meeting tomorrow night. The last time we saw them was in January of 2008. When we came home in 2009 it was summer time and there are no yacht club meetings. We spent the entire morning sorting through things we have stored in Heather and Jed’s basement and packed those things that will go to our storage unit in New Hampshire in the car. We are taking all of our paper charts (eleven chart tubes worth), summer clothes, spare boat parts, and loads of boating books. We still have way too much stuff in Heather and Jed’s basement, but we are planning to put things on Craig’s List to try and sell them. If they don’t sell and we can’t give the stuff away, we’ll take it to the dump. In the meantime, we also thank Heather and Jed for putting up with our stuff for the past six years and now that we are home. We know it crowds an already crowded basement. Heather and Jed, we are so appreciative. Thank you. We know we have got to deal with the whole storage issue over the next year. The storage unit is not cheap and we have definitely paid more for it over the last six years than the things in it are worth. But it is truly hard to part with some things that are never going to fit on a boat. Our friends Heather and Jon who just sailed south did a very smart thing that I wish we had done. They bought a small piece of land in Vermont near where Heather’s parents live and built a garage on the property. They store all of their things there and the money they have invested is not lost. We have basically thrown away the $9,000 we have paid for the storage unit over six years, so we definitely have to do something different soon. I spent the afternoon with Sam and Jonah at Heather’s while Mark returned to the boat to meet Randy, the refrigeration repairman. It appears that our refrigeration system has a slow Freon leak, but Randy can’t find it. He charged it and put some sort of dye in the system. When the charge runs down, he will return to charge it again and hopefully the dye will help him find the leak. He is still waiting for parts to repair our reverse cycle heater/air conditioner. He hopes to get that done before we move to Fiddler’s Cove late next week. So the boat repairs continue. With Jed gone, we stayed at Heather’s for dinner and then helped with after dinner play and bath time for the boys. We are so delighted to be here to help out. It helps erase the guilt for not being around for the past six years. But it’s more than that. We just enjoy being around the grandchildren. I just wish Justin and Jo lived closer so we could spend more time with Ziggy. But we’ll just have to make the best of our two weeks with him at Christmas. The ospreys have all flown south for the winter. And daily we see flocks of geese headed that direction. 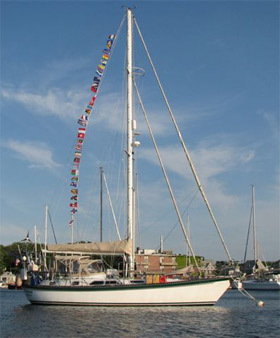 Bob Morris, on his boat Apogee, left Eel Pond today headed for Bermuda. A couple of weeks ago, Steve and Irene of Star left the pond for their winter home in Nevis in the Caribbean. And our friends Jon and Heather who came through Buzzards Bay last week emailed today saying they had to divert because of the weather and go through the Long Island Sound. They will head down the East River tomorrow and on to Norfolk. As the weather gets cooler and cooler, heading south sure is tempting. Lots of friends are headed south, but we’re staying put. Right now we don’t have anything to shield us from the cold other than polar fleece vests and windbreakers. We do have our foul weather gear and we have been using that, but getting to our storage unit in New Hampshire is something we need to do sooner rather than later. Since Jed is out of town for the next eight days, we thought we should stay close-by to help Heather with the boys. But she said today that she can take Thursday afternoon off work to be with Sam and Jonah, so we might take advantage and head for New Hampshire. Mark doesn’t have to be at work on Friday until noon, so we could actually go to the Concord Yacht Club meeting on Thursday evening and head home on Friday morning with winter coats and sweaters. It will help tremendously to have weather-appropriate clothing! To pee, or not to pee . . . paraphrasing Hamlet, “that is the question” that Mark has been asking since June. Today he went to Mass General to have a prostatic stent put in the urethra. This was a temporary experimental procedure to see if expanding the urethra would allow him to use his abdominal muscles to pee without using a catheter. Neither Mark nor the doctor was very hopeful, but it worked! So for the first time since June, Mark is fairly optimistic that he might not actually have to continue to self-catheterize every time he goes to the bathroom. After they do the laser procedure to widen the urethra on December 9, he should be able to pee normally as he did all day today with the stent in. The name of the prostatic stent is The Spanner. Most descriptive. Otherwise, today was all about Halloween. At 11:15 am, Sam and Jonah’s classes from the Woods Hole Cooperative Day Care paraded down the main street in Woods Hole. The two year-olds were adorable dressed in their ladybug, Nemo, fairy princess, and lion costumes. The four year-olds paraded as super heroes, dragons, skeletons, Count Dracula, a duck, and of course, more princesses. The teachers were dressed as the characters from the Wizard of Oz. It was all very cute. Tonight we went to Heather and Jed’s and gave out candy while a Dinosaur Heather, Wizard Jed, Superman Sam, and Ladybug Jonah went out Trick or Treating. The dino and wizard costumes were made by Mark and me over 25 years ago. They have certainly been well used over the years. Jed leaves tomorrow for eight days in Europe. He starts out at a conference in France and ends up in England before returning home next week. While Jed is gone, I’m sure Mark and I will be spending more time at Heather’s in the evenings helping with the kids. On Friday another Xantrax inverter/charger should arrive and Mark will spend much of his weekend doing the installation. When he got to Boston this morning, he called the Xantrax service center in Massachusetts to see if he could bring in the inverter/charger for them to check. They told him to take it back to West Marine and have Xantrax send a new one. Evidently this particular unit is so new that they have no repair parts yet. So let’s hope the second one doesn’t fail as it appears we have no local support. This is a test and I’m not sure I’m going to pass. We have just had one thing after another go wrong and this morning I couldn’t believe it when the both the refrigerator and the brand new inverter/charger were both NOT working. We think the refrigerator has a slow leak somewhere and needs to be recharged with Freon, but we have absolutely no idea what went wrong with the inverter/charger. Mark installed the new inverter/charger on Thursday and it was working great. Then during the night last night it started making a loud buzzing noise and then just totally quit working. We are at a loss in figuring out what happened. Mark goes to Boston to the doctor tomorrow and will take the new Xantrax to the closest repair facility a little north of Boston. Then we will just have to wait and see what they say. Mark worked at West Marine today and I spent my day being frustrated by one thing and then another. I had planned to bake a pumpkin pie today. I bought the things needed on Wednesday, but not until I went to get the can of pumpkin out today did I realize that all the groceries I had bought that day were in the bag that was stolen. I went to the little market here in Woods Hole and bought what was available. By making some changes in the recipe, I did end up with a pumpkin pie. Heather, Jed, and boys were in Woods Hole for a Halloween story telling evening at the community center. Afterwards they walked across the street to Windbird for dinner. 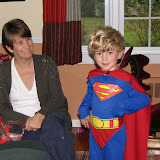 Jonah was dressed in his ladybug costume and Sam arrived as Superman. They were both “super” cute. Tomorrow they will wear the costumes to school and there will be a parade through town just before noon. You know Oma will be out there taking photos of Ladybug, Superman, and all their friends. When we got home from the Captain Kidd this evening, we got on the computer and continued searching for the cheapest way to travel from here to New Mexico to visit with Justin, Jo, and Ziggy. We talked with them last night and decided that a Christmas visit would work for all. So we searched all day and then we searched all evening trying to find fares that we can afford. We actually ended up deciding to travel by bus instead of flying. That gives us the option of leaving Woods Hole on a bus and not having to worry about where to leave our car in Boston. And when we return, we can hop on a bus in Boston and be home in less than two hours. On our way out to New Mexico, the timing is such that we will be able to get off the bus in Albuquerque and then ride the New Mexico Road Runner train from Albuquerque to Santa Fe where Justin and Jo will pick us up for the last part of the journey. If we flew out, we would have to spend the night in a hotel in Boston in order to catch the 6 am flight out and we would have to spend the night in a hotel in Albuquerque waiting for the flight home. The bus will cost us just a little more than the flight for one of us. It will be slow, but we have convinced ourselves that it will be like being on passage. We’ll take our headlamps and at night we’ll use them to read, alternating with trying to sleep. This little venture will certainly give us a chance to see what the bus system is like in this country. It is a slow way to travel, but we definitely have more time than money, and it is certain to be an interesting trip. We got the last of our computers and parts back from the computer shop today. The Sony Vaio went in because of a keyboard problem and it still has a keyboard problem. They installed a new one but found that it was really the connection of the keyboard to the mother board. Instead of spending $300 for a new mother board and $100 for installation, the computer shop recommendation is to buy an external keyboard that plugs into one of the USB hubs or just abandon this computer and buy a new one. The good news of the day was that they were able to obtain all the data from my old external hard drive that crashed. That doesn’t give me back the photo changes and writing of the past four months, but at least I have everything prior to July of this year. After checking with the drive recovery business the shop here recommended about my new external hard drive, we have decided that the minimum cost quoted of $700 and going up to $2800 to get the data off that drive is just not worth it. I have already started the rewriting and am going to start reorganizing the Year 1 photos today. We spent the early part of the evening at the Captain Kidd having drinks with Victoria and Chad, the young couple we met last night on the dock. Both of them have traveled extensively and it was fun to share stories. They spent their honeymoon in Savusavu in Fiji and we both agreed that the people of Fiji just might be the friendliest in the world. 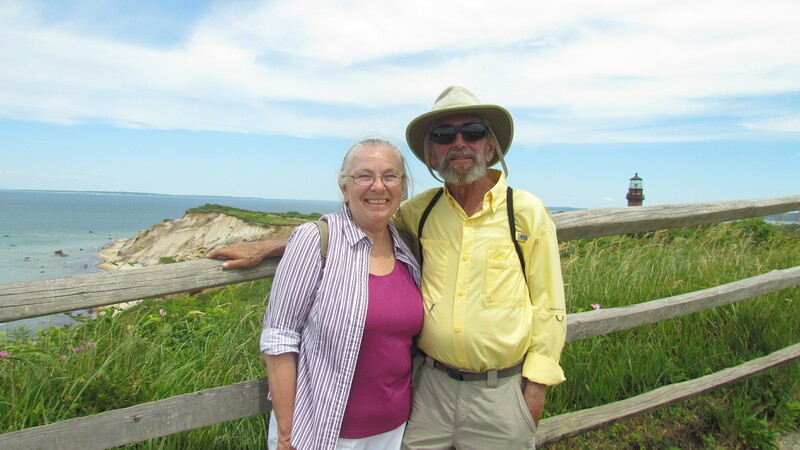 They are very interested in hearing more our travels, so we hope to get together with them at least one more time before we leave Woods Hole to go to our winter home at Fiddler’s Cove. I don’t like it when the outside temperature is lower than my refrigerator temp, but that is the case tonight and it will continue to be the case through the next few months. Ouch! Once we get to our storage unit in New Hampshire and get appropriate clothing for the cold months I’m sure we’ll feel a bit better about this, but after spending most of the past six years in the tropics, the onset of winter is especially tough. Right now the winds are howling and the rain is pouring outside, but at least it is warm here inside Windbird.